sends HDMI audio/video from any of 4-HDMI sources to any of 4x2 = 8 displays over 4-HDMI outs and 4-single CAT5e/6 cables. Because it is a matrix switcher it allows any input to be sent to any output or the same input to be sent to all outputs or any of the 256 combinations. 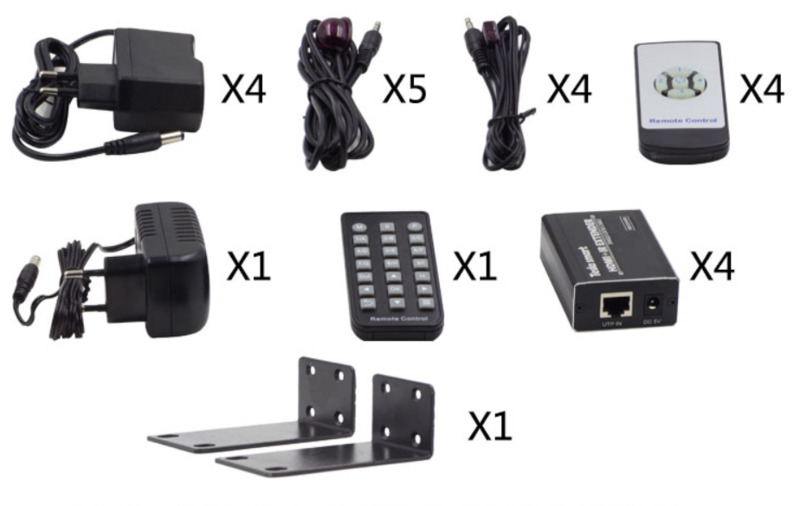 The 4-HDMI receivers and their AC adapters are included in the price as well as the main 21-button remote control and 4-other remotes used in the far away rooms. This 4x4 HDMI matrix routes 4 Full HD sources to 4 output sets, each output set has one HDMI local output and one UTP extension output. The UTP extension supports 1080p@60Hz transmission up to 175 feet or 60 meters. Each source can be routed to any output, using the front-panel buttons or the IR Remote Control. The matrix can also be controlled via RS-232 or the IP interface. With smart EDID management, it makes it compatible with most of the HDMI source and sink devices. HDTV Supplys WolfPack 4x4 (4x4x2) HDMI Matrix Switch over CATx can accept 4 - HD HDMI signal inputs & outputs 4 - HDMI and 4 - CAT5e/6 RJ45 signal & you can select any one of 4 video inputs to any of the 4 outputs in any combination. This 4x4 matrix can support a maximum of 1080p 3D or 1080p 60 Hz resolution & also includes a 4x4 bi-direction IR matrix companion with video matrix extender output. The 4x4 HDMI matrix is fully compatible with HDMI 1.3c (HDMI 1.4 3D) & HDCP 1.3. NOTE 1: If both the CAT5/6 and the standard HDMI outputs are used, the number of total outputs would be up to 8. Each individual zone (example, VIDEO OUT 1) of the CAT5e/6 and HDMI output would have the same picture, though. Think of it as a 4X4X2. Since the matrix switch also has 4-female HDMI outputs you can use these with the above optional stand alone HDMI extenders if you have long distances to where your widescreens are located at. Those extenders are standalone and don't support IT through the matrix. ...and at less than $600 compared to our competition which costs upwards of $2,500. When the HDMI signal progresses through 4x4 HDMI Matrix Switcher over CAT5 it is re-timed, level compensated, its phase error is corrected, and any data jitter is eliminated so the output is a regenerated brand new perfect HDMI signal as when it was coming from the source device. 4 - HDMI input signals switched or split to 4x2 devices. HDCP 1.3 protocol compliant on all inputs and outputs. Supports DVI-D single link sources and displays with the use of HDMI-to-DVI adapters. Supports a Blue-Ray 24/50/60fs/240 and above / HD-DVD / xvYCC. Digital audio format, as DTS-HD / Dolby-trueHD / LPCM7.1 / DTS / Dolby-AC3 / DSD. Supports input up to 30 foot AWG22 HDMI 1.3 standard cable length, output up to 30 foot AWG22 cable length. With a clean looking front panel display the user can know the relationship between the inputs and outputs. NOTE 2: There are 4 -USB ports on the back panel but they they cannot be used with this matrix as this model is not supplied with KVM HDMI extenders. The outstanding EDID learning function is necessary whenever you encounter any display on the HDMI output port that cannot play audio and video properly. Because the HDMI source devices and displays may have various level of capability in playing audio and video, the general principle is that the source device will output the lowest standards in audio format and video resolutions to be commonly acceptable among all HDMI displays. In this case, a 720p stereo HDMI signal output would be probably the safest choice. Nevertheless, the user can force the matrix to learn the EDID of the lowest capable HDMI display among others to make sure all displays are capable to play the HDMI signals normally. The 4x4 HDMI Matrix Switch over CAT5 allows four HDMI devices to be switched or split easily to four HDMI compatible monitors or projectors over a single CAT6 (preferred) cable. The 4x4 HDMI Matrix Switch over CAT5 RS-232 control allows the switcher to also be controlled by 3rd party control systems like Crestron and Control4, or many other computerized software/hardware control systems. Software is NOT supplied for 3rd party systems. Why not buy this WolfPack 4x4 HDMI Matrix Switch over CAT5 today? Why not buy this 4x4 HDMI Matrix Switch over CAT5 today? Q: What are the USB ports used for? A: They cannot be used as this model is not supplied with KVM HDMI extenders. Q: Does it support CEC? Q: How does the EDID learning function work? Q: Where can I find info on the remote IR function? A: The Users Manual is at the MANUALS Tab at the product page. The remote IR function supports the standard 38-KHz frequency and supports single beam remote controls although most buyer use this Learning RF and IR Remote Control.